justthefood.com...the blog: Why yes, that IS avocado on my pizza. Wow, that really looks pretty darn delicious. I ACTUALLY have all that in my house. Must make soon! Maybe tonight! Great pics! I LOVE avocado on pizza. its all creamy and lovely. looks YUM! 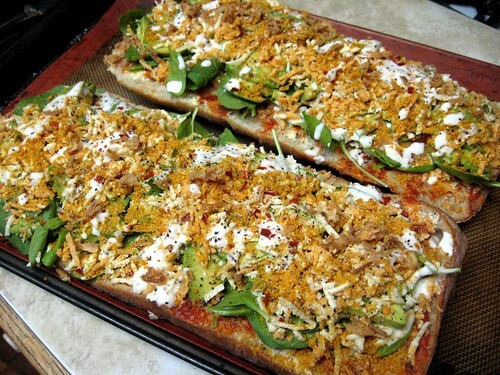 Love the idea of using ciabatta bread as the crust for pizza!! Mmm... LOVE avocado on pizza ! There is nothing garbage about that pizza! It's beautiful!!! This is so genius. I'm a little speechless. That looks amaaazziinngg! I've never tried any Follow Your Heart dressings. Next time I visit my folks in the states, perhaps! okay, I already love this. 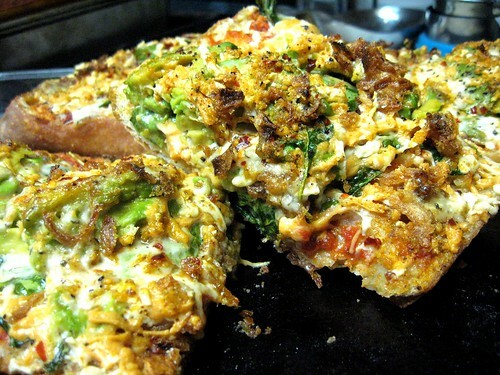 I usually do garbage stir fry, but I think garbage pizza is even better! you have outdone yourself, m'friend. heck double whammy yum.